I love the screen recording tool in Storyline 360 because you can use it to closely simulate real-life tasks inside of different systems and software applications. It’s actually a very robust feature with a lot of customization options and great capabilities—and, it’s super easy and intuitive to use! Let me take you through how to get started with it, and some cool ways to use it in your work. It doesn’t matter which way you do it; it’s just your personal preference. 1. Choose a pre-set dimension from the drop-down list. 2. 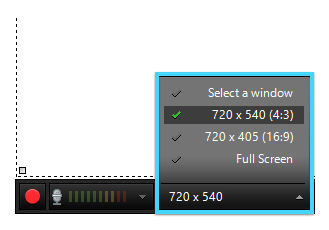 Adjust the window size using the sizing handles. Not sure what size you should use for recording? Check out this article for some tips on recording high-resolution screencasts. Next to the “recording size” drop-down menu, you’ll notice a little gear icon. Click this to adjust settings like which microphone (for voiceover audio) and/or speaker (for system sound effects) you want to record. 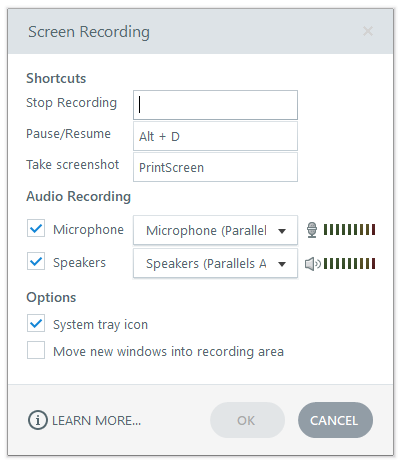 In this window, you’ll also find another cool feature called “Move new windows into recording area.” If you’ll be switching between apps or windows during your recording, you’ll want to be sure to check this option. Once you’ve specified your dimensions and your settings are good to go, you’re ready to start recording! Just click the red record button, wait for the countdown, and then go through the steps you want to record. If you make a mistake and want to start over, click the garbage icon. When you’re done, hit the escape key on your keyboard or click Done in the recording bar. Do a test run. Even if you’re 100% certain everything works perfectly, test it anyway! I learned this the hard way after doing a whole one-hour recording only to realize when it was over that my microphone was muted the whole time. Recording and playing back a 5- to 10-second test clip can save you a lot of time and unnecessary frustration. Keep the screen clean. Ideally, you want the application you’re recording to fit snugly within the recording area. It’s best not to see any desktop in the background or any other applications in your recording. So don’t forget to hide any bookmarks, toolbars, desktop pictures, and the start menu if you can. 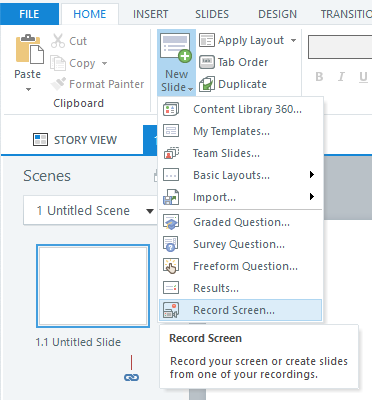 I hope you found this Storyline 360 screen recorder tutorial useful! As with everything in life, practice makes perfect, so play around with the recorder—try it out and do a few sample recordings to get a feel for it. Have any Storyline 360 recorder or general screencasting tips of your own? Feel free to share in the comments section below! And, of course, if you have any questions, be sure to leave those there as well. Want to try something you learned here, but don’t have Storyline 360? 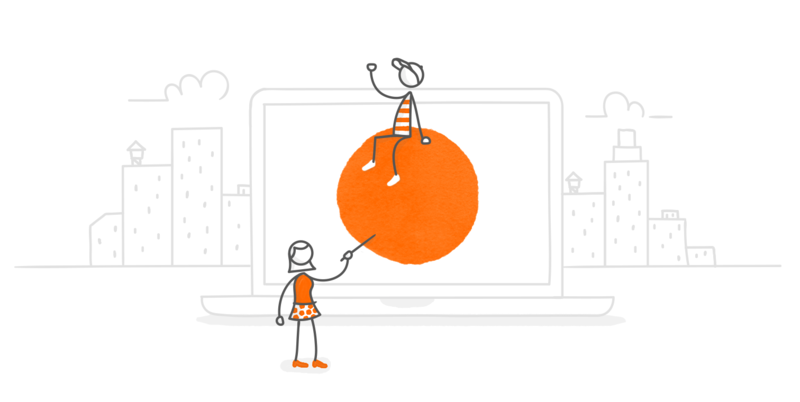 Start a free 60-day trial of Articulate 360, and come back to E-Learning Heroes regularly for more helpful advice on everything related to e-learning. Whenever I do a screen recording, I first open the Notepad application and maximize it. Presto! Instant full-screen white background! Then I set up my recording window and recording software in front of (and a bit smaller than) the Notepad. No need to change your desktop background. If I have recorded a screen... after I save the video...can I adjust the speed? OR can I change it to the step by step version? Can you hide the pop up screen tips which show up in most applications during recording? For example in Internet Explorer when you are recordgin at times short cuts or tool tips or URLs show up - i would like to hide these items. Nicole maybe i am missing something, but i have already viewed the editing screen recordings article and there wasn't anythign in there about how to adjust a setting to hide the screen or tool tips. Covering them with a colored box is not an option because at times they are either not on a solid bckground or they are actually covering something i want the user to see. You'll need to use the action fine-tuning editor. Right-click on a slide and from the menu choose Action Fine tuning. That's how to edit the background of a screen recording! Pro-tip: Remember that you will still need to Insert Slides and save the .STORY file after click DONE. And it's normal for it to take several minutes to save a long recording. I just finished a course that used a lot of screen recordings that I used in the lightbox feature of Storyline. To emphasize and draw attention to areas that the mouse was moving on the screen I used the zoom feature which I would recommend if you are trying to have the user focus on a certain area. Sometime the screen can be small and difficult to see the fields so this is one way to overcome that. Doug, I'm a newbie, but I believe I'm trying to accomplish the same thing you did. I have a form that I want to walk people through how to complete while explaining what goes where, and why. Is there a way to highlight the mouse to make it easier to follow? You mentioned zooming in, but I can't figure out how to do it. Any suggestions? Hi John, Insert/Zoom Region. Set the size you need and place it where you want it. In Timeline you determine when you want zooming to start and end, and for how long to zoom. You can use as many zoom regions as you like (I think) in one slide. Show the zoom until end of slide has worked for me in the past but you have to remember to set it on every zoom region. I'm just trying to do a simple screen capture of a PowerPoint. However, I used an older version so I can't use the PPT import. Which is fine. I'm switching from Captivate, BTW, which was awful. However, I can't figure out how to mute external noise and only have it play the audio that is already embedded in the presentation. Can you help? Have you tried exporting PPT to video? Not sure the parameters of your project, but if you want the PPT audio and timings, with no external sound, you can set all the slide lengths in PPT, then export. Hi Marcie, I had the same problem with my first recordings. In my case, I pressed the F4 key on my PC (mute), and that did it. Is there any other way to end a recording other than to press escape?